These are 12mm Apple Green Round Crackle Glass Beads on an 8" string, approx. 18 beads. These are 12mm Aqua Round Crackle Glass Beads on an 8" string, approx. 18 beads. These are 12mm Autumn Leaves Crackle Season Glass Beads on an 8" string, approx. 19 beads. These are 12mm Black n Brown Crackle Season Glass Bead, approx. 17 beads on an 8" string. These are 12mm Bubblegum Round Crackle Glass Beads on an 8" string, approx. 18 beads. These are 12mm Burnt Orange Crackle Glass Bead, approx. 18 beads on an 8" string. These are 12mm Busy Bee Crackle Season Glass Bead, approx. 17 beads on an 8" string. These are 12mm Buttercup Crackle Spray Beads, approx. 18 beads on an 8" string. These are 12mm Champagne Round Crackle Glass Beads on an 8" string, approx. 18 beads. These are 12mm Charcoal Crackle Glass Bead, approx. 18 beads on an 8" string. These are 12mm Cotton Candy Crackle Season Glass Bead, approx. 17 beads on an 8" string. These are 12mm Crimson Round Crackle Glass Beads on an 8" string, approx. 18 beads. These are 12mm Dark Blue Round Crackle Glass Beads on an 8" string, approx. 18 beads. These are 12mm Dark Brown Round Crackle Glass Beads on an 8" string, approx. 18 beads. These are 12mm Dark Green Crackle Glass Bead, approx. 18 beads on an 8" string. These are 12mm Deep Aqua Crackle Glass Bead, approx. 18 beads on an 8" string. 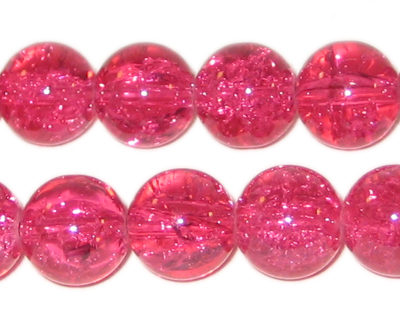 These are 12mm Dusty Pink Crackle Glass Bead, approx. 18 beads on an 8" string. These are 12mm Early Spring Crackle Season Glass Beads on an 8" string, approx. 19 beads. These are 12mm Fall Colors Crackle Season Glass Beads on an 8" string, approx. 19 beads. These are 12mm Fire and Rain Crackle Season Glass Beads on an 8" string, approx. 19 beads. These are 12mm Forget-me-not Crackle Spray Glass Bead, approx. 18 beads on an 8" string. These are 12mm Fuchsia Round Crackle Glass Beads on an 8" string, approx. 18 beads. These are 12mm Geranium Crackle Spray Glass Bead, approx. 18 beads on an 8" string. These are 12mm Golden Brown Crackle Glass Bead, approx. 18 beads on an 8" string. These are 12mm Greenbrier Crackle Spray Beads, approx. 18 beads on an 8" string. These are 12mm Iris Crackle Spray Glass Bead, approx. 18 beads on an 8" string. These are 12mm Light Brown Round Crackle Glass Beads on an 8" string, approx. 18 beads.